Photo: Ernst Emersleben. Creative Commons BY-NC-SA (cropped). An economics-driven approach to urban development will inevitably aim to maximise the value of land area; this has led to the construction of dense, high-rise urban jungles in many countries and resulted in a swathe of identical, generic urban skylines across the globe. 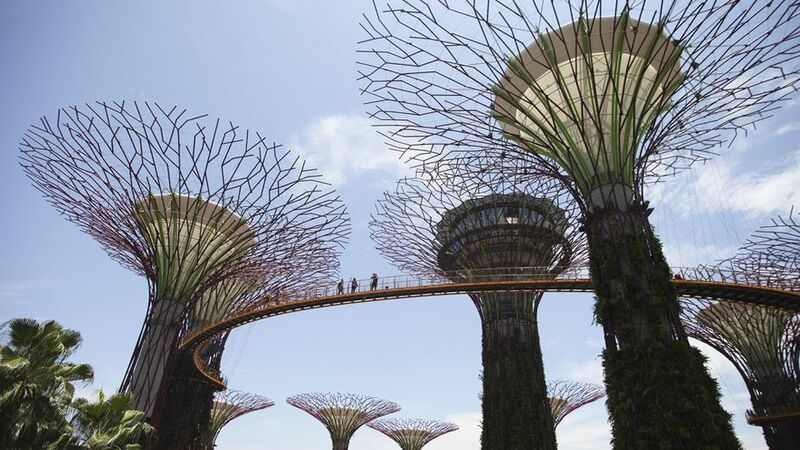 This is no way to create cities that are sustainable or liveable, according to British landscape architect Andrew Grant, one of the key figures behind Singapore’s award-winning park, Gardens by the Bay. Speaking at a plenary session at the recent International Green Building Conference, Grant, who founded and heads UK-based architecture firm Grant Associates, said that most urban expansion globally is taking place at the expense of surrounding natural spaces. Many urban planners seem largely unconcerned about the need to incorporate nature into cities, he added. This is not only desensitizing people to pressing issues such as the biodiversity loss resulting from habitat destruction and climate change, but has also led to a dearth of opportunities for city dwellers to access the inspiring and rejuvenating qualities of the natural environment, said Grant. 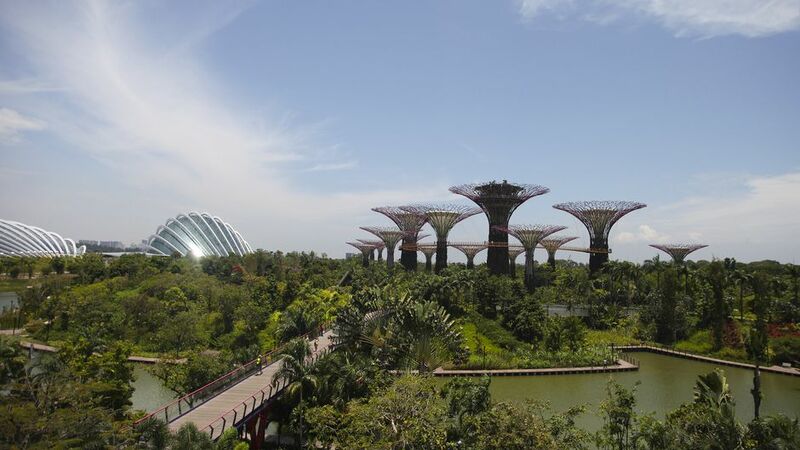 Singapore’s Gardens by the Bay, from afar, conservatories on the left and Supertrees on the right. 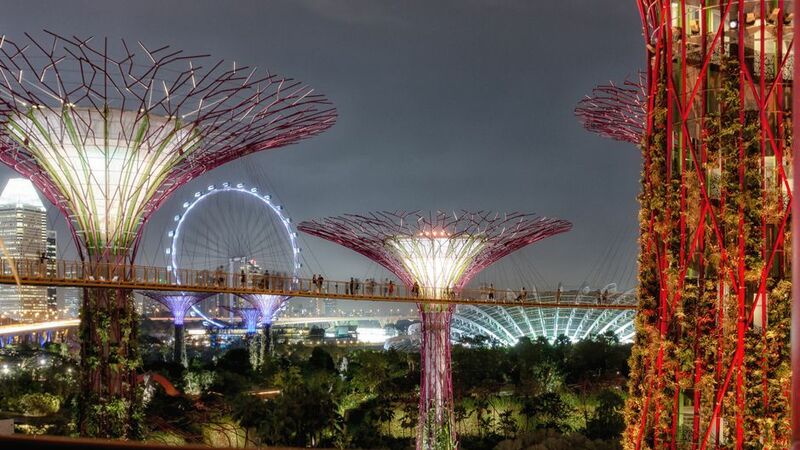 Solar energy harvested from photovoltaic cells on some of the Supertrees’ canopies is used for lighting them up, while others are integrated with the conservatories and serve as air exhaust receptacles. Photo: Nicolas Mirguet. Creative Commons BY-NC (cropped). Grant called for ‘ecological thinking’ to be introduced into urban planning efforts, which is an approach that allows for natural spaces and structures to evolve without intervention, and accepts the lack of predictability and structure that this would introduce into the landscape. He cited the example of how the presence of wild boars in Singapore had generated excitement amongst some residents, and even served as a muse for a local artist’s work. Embracing the unpredictability and lack of structure that accompanies natural spaces in a city would help to shift cities away from being “ornamental, artificial worlds” and instead recreate a more organic and engaging urban experience for residents, said Grant. He added that in Singapore’s context, what would be needed to create a unique and meaningful sense of landscape were big forest trees. This “would not only capture people’s imagination, but also create an integrated system that helps manage water flows in the city, allows spaces for biodiversity to flourish, and improves air quality,” said Grant. “I don’t think these multiple benefits can be achieved through vertical greening, you need a bigger scale of landscapes to do that,” he added. To minimise the destructive impact of urbanisation on the natural environment, Grant argued that it took both cities and wild landscapes to make up a sustainable urban entity, and that both environments should not be regarded separately. To highlight this symbiotic relationship, Grant suggested that cities could be twinned with neighbouring natural areas — that is, the growth of cities could be jointly tracked with the health of wild landscapes. A financial mechanism could ensure that a city invested in measures to minimise or repair the harm done to surrounding green spaces, added Grant. He went on to acknowledge that it was not yet clear if this idea was a practical possibility, but said that “twinning would be a powerful public display of the recognition that cities have with surrounding natural areas”. Photo: Nicolas Mirguet. Creative Commons BY-NC (cropped). The importance of creating a strong link between individuals and sustainability goals was also a defining feature of the newly launched third Green Building Masterplan, which is the Building and Construction Authority’s (BCA) green building blueprint for the next decade. Dr John Keung, chief executive officer, BCA, who also spoke at the plenary session on addressing the green community, stressed the importance of engaging building occupants to reduce energy consumption and building up expertise on green building strategies within Singapore’s workforce. Keung said that one of the main challenges standing in the way of Singapore’s bid to have 80 percent of its building stock certified under the national Green Mark scheme by 2030 was the need to raise public awareness on the importance of a sustainable built environment and engage building owners and tenants to further reduce their energy consumption. He shared that the new Masterplan included a slew of incentive and reward schemes to encourage this behavioural shift, including a new ‘Pearl’ category for the Green Mark scheme, S$50 million worth of grants to improve energy efficiency, and a ‘Green School Roadmap’ designed to encourage teachers and students to improve the energy efficiency of their schools. In response to a question from the audience on public sector leadership, Keung added that in addition to focusing on awareness, it was also important for the government to work closely with the private sector to drive a country’s green building movement forward. He suggested that the public sector could serve as role models for the industry by investing in green building technologies early on. Their energy savings would help make a strong business case for the industry to embrace green building practices soon after, he added. “We have come a long way since the green building movement was initiated in 2005,” said Keung, noting that “the challenges ahead are equally daunting, and Singapore is committed to playing the role of a global green building leader and sharing our experience with cities in the tropics and subtropics”. “This will not only achieve a more sustainable environment for Singapore, but also take the green building movement to the next level in the region,” he said. Gardens by the Bay’s two cooled conservatories are intended to be an energy efficient showcase of sustainable building technologies and to provide an all-weather edutainment space within the Gardens. They are special in two ways: both are very large (around 1 hectare) and yet have glass roofs without additional interior support (such as columns) and were built with a view to minimising environmental footprint. 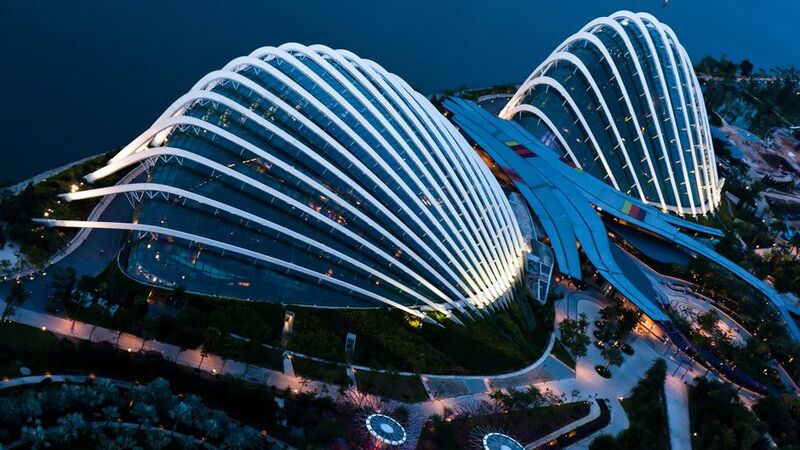 Rainwater is collected from the surface and circulated in the cooling system which is connected to the Supertrees, which are used both to vent hot air and to cool circulated water. Photo: Hari Krishna. Creative Commons BY (cropped). This article was first published on Eco-Business and appears here with permission. Article is copyright Eco-Business, all rights reserved. See each photo for Creative Commons reuse conditions. Vaidehi Shah is a correspondent for Eco-Business. She has worked in Singapore’s sustainability sector since 2008, in non-profit and government organizations. She has worked in various fields including corporate communications, policy research, and project management, and has overseen initiatives such as the Asian Environmental Journalism Awards 2012 and 2013, a research paper on reducing plastic bag use in Singapore, and a quarterly environmental newsletter. She is particularly interested in how sustainability intersects with behavioural change, inclusive growth, and gender equality. Vaidehi studied Geography at the National University of Singapore, and Gender and International Development at the University of Warwick. Urban Mobility: Can Latin America Learn from East Asia?